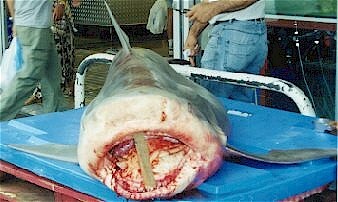 This 3.5 metre Bull Shark (or River Whaler) was caught by fishermen in 2 metres of water at Grotto Point, Clontarf. The male shark has been identified by Australian Museum representatives, as an aggressive breed of shark known as the Bull Shark, they have the ability to tolerate fresh water. They are fairly common to Sydney Harbour, especially during the summer when the water was warmer. They are not a protected species. The shark was on display at DiCosti Seafoods at the Sydney Fish Markets, where it remained for several days before the body was given to the museum for research.